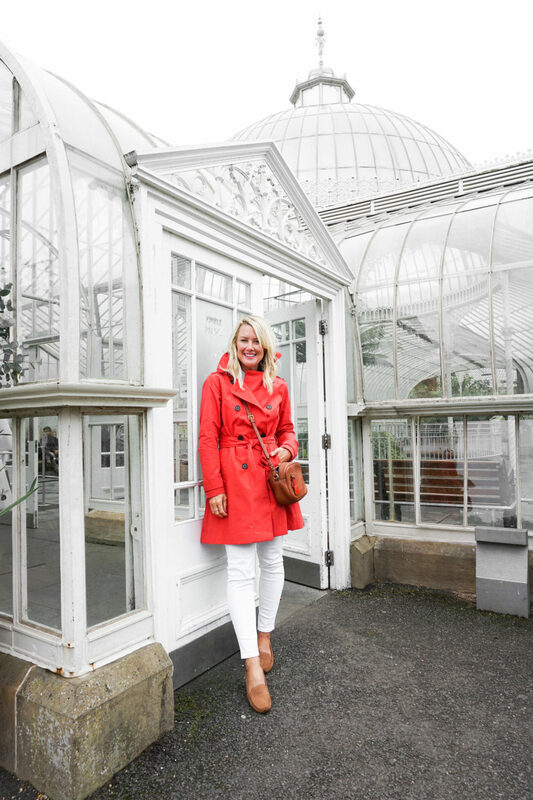 7 Ways to Wear a Trench Coat | hi Sugarplum! Some wardrobe staples are so chic, they have the power to transform an outfit. Case in point, the classic trench coat. No matter the style or color, simply adding this timeless jacket to virtually any outfit, makes it instantly chic. I’ve owned this particular trench for years, and while I wear it year-round, Spring and Fall are when I reach for it most often. It’s perfect for a light rain, transitional temperatures, or simply a chic layer. 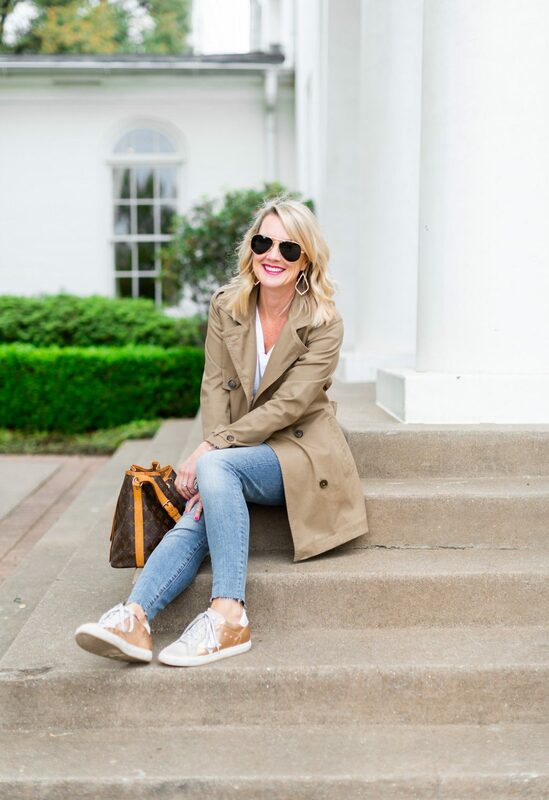 Today I’m sharing seven ways to wear a trench, and you’ll see how chic it makes even the most basic outfits. First outfit is a simple black sweater and white jeans, with added style power thanks to the trench and a few key statement pieces. My belt is a designer lookalike, but I’ve been wearing it so frequently I’m considering the real deal! Especially since I found one for significantly less on eBay here! This designer handbag was my grandmother’s, so it has sentimental value and a vintage style. eBay is not only a great source for the lowest price on designer bags, but also finding discontinued styles! 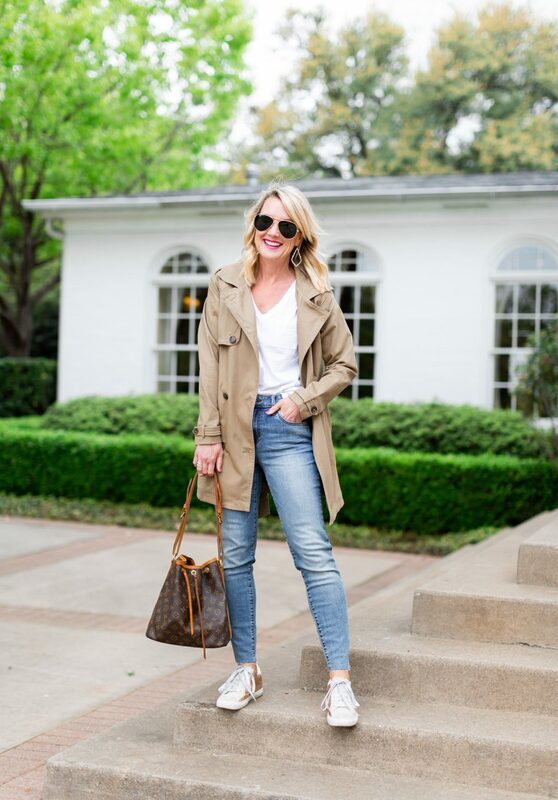 Even a basic white tee and jeans is instantly more stylish with a trench! Sugarplum Style Tip: If wearing the trench open, tie the belt in a cute bow in the back for an unexpected twist. Are you a trench coat girl? If so, I’ll bet you’ve had it for ages…it’s a piece that never goes out of style! 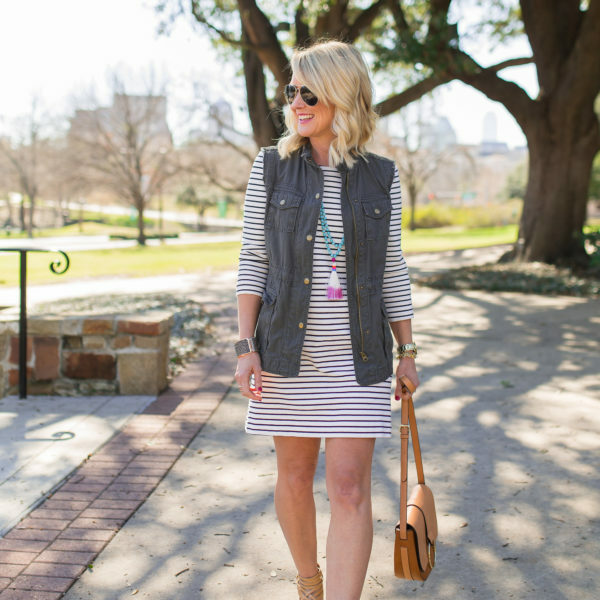 I hope this post inspired you to pull it out for Spring! And what about designer pieces…have you scored a beauty on eBay? I’m currently watching several items, but can’t decide between a handbag, belt and sneakers! Any suggestions? Cassie, I love a trench and you make it look especially good. I recently upgraded from a London Fog to a Brooks Brothers and it is vastly different. 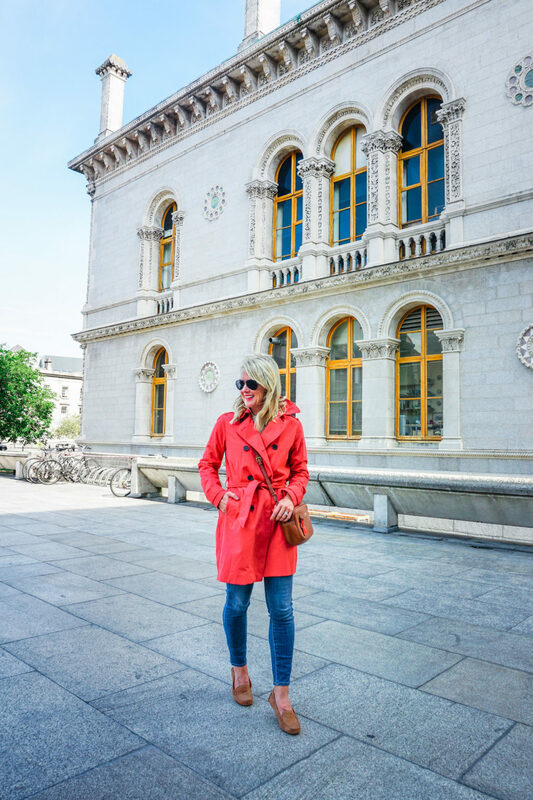 I love my new trench! I have had some bad luck on eBay, but I know it’s because I didn’t research enough or understand the terms of description. I paid $$$ for a used LV Totally only because they no longer make them to buy new. 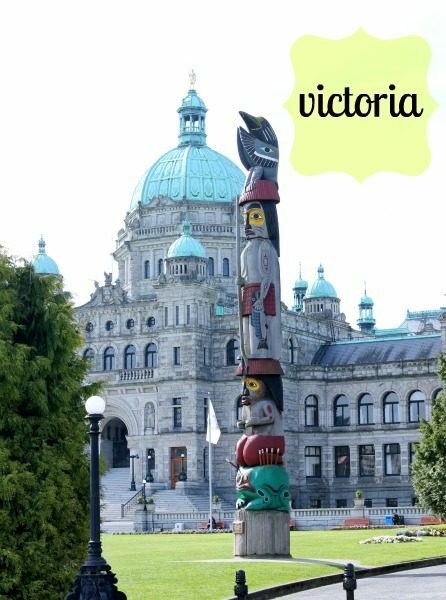 It is not in good shape. I overpaid and now have a bag I wouldn’t carry. I’m sure others are more savvy than I, but just a warning to take your time and read and research. I’m just curious if you wear any type of no show socks with your loafers or pumps? I hate when the sock peeks out a bit but I hate the feeling of shoes with no socks! Help! 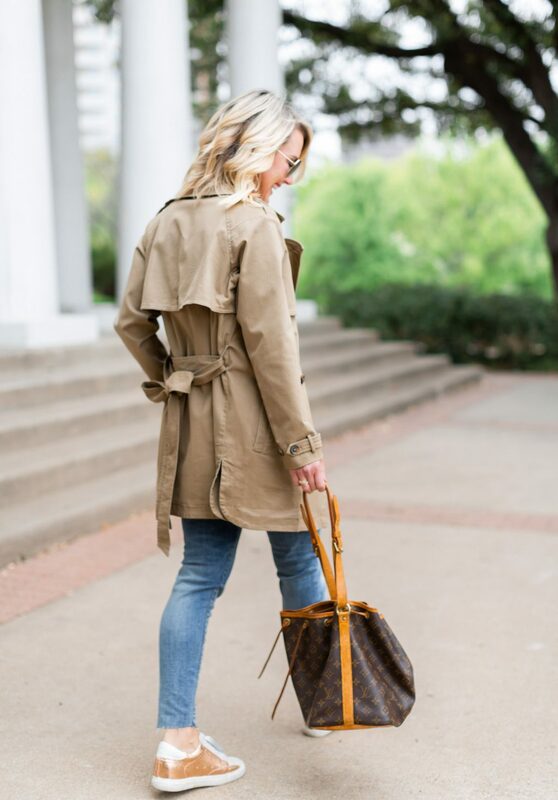 Love all these cute ways you styled your trench coat! I bought one last spring that I’m in love with. You’re so right, it just elevates any outfit!